Analysts have found that the UK uses various controversial strategies to support MKO terrorists. The Mujahedeen-e Khalq Organization (MKO), an anti-Iran terrorist group-let, whose members are straying across Europe and the U.S., receives all-out support from the UK government through various controversial strategies, according to detached members. In December 2012, it was revealed that an unnamed British company has bought the movable property of Ashraf Camp, located in the eastern Iraqi province of Diyala near the Iranian border, worth $25 million. It also offered the Iraqi government $500 million for the camp, media reports said. The unnamed company then declared that 60 percent of the proceeds of the transaction will be given to MKO terrorists. 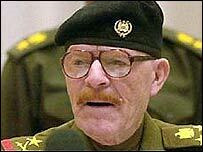 The terrorist group-let was uprooted from Iraqi soil as stipulated in the country’s law. The MKO, which is responsible for the deaths of 17,000 Iranians since the 1979 Islamic Revolution, fled to neighboring Iraq in the 1980s. The group received military training from former Iraqi dictator Saddam and set up its camp near the Iranian border in order to be able to carry out terror acts inside Iran. The group also cooperated with Saddam in the massacres of Iraqi Kurds and in suppressing the 1991 uprisings in southern Iraq. Later in December 2012, a former MKO member, Massoud Khodabandeh was interviewed on Press TV’s political program The Monarchy where he pointed out that the anti-Iranian terrorist group would not survive without support from Britain and other Western states. “I don’t see any terrorist organization capable of continuing, unless somebody wants it. Somebody has got to want this terrorist organization [MKO], somebody has got to finance it and somebody has got to arm it,” Khodabandeh said. “One of the reasons that I am saying they have support is; not facing them directly to stop their violent activities in the West and to stop their money laundering in the West. When I say money laundering, I have been in it, I have seen it. This is not an unknown concept for the British government”, he added. In a documentary called Cult of the Chameleon, aired on Al Jazeera back in 2007, Khodabandeh’s wife Anne Singleton, also a former MKO member from Leeds, UK, explained how she was manipulated and taken into the cult by active MKO terrorist group members, while she attended Leeds University in the 1970s. “When I became a full-time cult [MKO] member, I gave up everything that I had. I gave up my home and all the possessions in it,” Singleton said on the documentary. Singleton eventually ended up in the Ashraf garrison for further manipulation and military training. Later on, she managed to escape the prison-like garrison, but with difficulty. Apart from Iraq and Iran, the European Union (EU), Canada and even the United States had listed the MKO as an active terrorist organization. So how was the cult allowed to freely manipulate, promote and recruit members for itself in a prominent British University? Moreover, a website called UK Committee in Support of Ashraf (UKCSA) is a London-based organization which openly supports the MKO. The organization has published articles and interviews and proposed the idea of removing the MKO from the US State Department’s list of foreign terrorist organizations. The UKCSA presents the Ashraf camp with pictures of greenery, flowers and natures, making it look like an attractive location for visiting. The UK-based website also makes out that it is a legal campaign helping people in the Ashraf garrison who are allegedly sick and that donations are needed to support ill patients in the camp. More UK support for the MKO came as in April 2012; the American Free Press website reported that Britain takes part in hidden operations in the Middle East to train MKO terrorists to target Iranian scientists and officials. “MEK fighters have also been trained at secret Middle East sites by special forces teams from Britain, the U.S. and Israel and have been supplied at U.S. taxpayer expense with state-of-the-art weaponry and surveillance gear”, the report said. The MKO is behind a number of assassinations and bombings inside Iran. A number of EU parliamentarians previously condemned a British court decision to remove the MKO from the British terror list. “There is a strong and growing tendency for both Canada and Mexican government to fall in line with Washington,” she added. “I am personally disgusted by the many years of political support for the MEK by neoconservative elements among the US political class,” Kwiatkowski added, calling the US shifts regarding the group as one of several ongoing “means of war and provocation” against Iran. Regarding the MEK's request to be recognized by France and other European countries, Dr. Kwiatkowski pointed out that the desire of anyone or any organization today for recognition by the militaristic US empire-mongers, i.e. the neoconservative wing of the Washington political class, indicates a flawed concept of both democratic change and a certain weakness in the movement, in this case, the anti-Assad movement. In a joint press conference with Prime Minister Nuri al-Maliki in Baghdad, Ban Ki-moon praised the Iraqi government's handling of the members of the MEK organization during their transfer to the new camp, pointing out that the United Nations puts great importance on helping Iraq to end this issue. For his part, Prime Minister Nuri al-Maliki, said that the MEK organization's ouster is irreversible. He added that "the existence of this organization has contributed to the growth of extremism and terrorism through its support for some terrorist groups in Diyala province." The Prime Minister expressed his hope that the UN accelerate efforts to close the file of the MEK organization with their resettlement in a third country. 29 November 2012 – Highlighting improvements in relations between Iraq and Kuwait, the United Nations top official in Iraq today said that progress will “depend on the restoration of confidence between both sides” and encouraged further momentum from the two countries. In a briefing to the Security Council on the situation in the Middle Eastern country, the Secretary-General’s Special Representative and head of the UN Assistance Mission for Iraq (UNAMI), Martin Kobler, noted how, earlier this year, Iraq demonstrated renewed commitment to improving its bilateral relations with Kuwait, and how he had “stepped-up” engagement with the two countries to see how the UN could best help resolve any outstanding issues in accordance with relevant Council resolutions. Relations between the two countries were affected by Iraq’s 1990 invasion of Kuwait. The following year, the Security Council established the UN Compensation Commission (UNCC), which settles the damage claims of those who suffered losses in the invasion. So far, the amount of compensation disbursed by the UNCC totals $37.7 billion for more than 1.5 million successful claims of individuals, corporations, Governments and international organizations. Successful claims are paid with funds drawn from the UN Compensation Fund, which is funded by a percentage of the proceeds generated by the export sales of Iraqi petroleum and petroleum products. 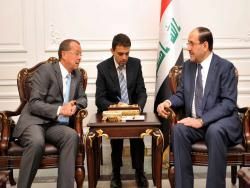 In his remarks, Mr. Kobler appealed to the Government of Iraq to “continue to demonstrate the goodwill necessary to fulfil Iraq’s other outstanding obligations, in particular to missing persons and property.” He noted how its commitment to fulfil these obligations will be conducive to the normalisation of relations between the two countries. “I equally call on the Government of Kuwait to continue to act in a spirit of flexibility and reciprocity as reflected earlier this year by the important reciprocal visits of the Amir in Baghdad and Prime Minister Maliki in Kuwait,” he said, adding that he remains fully committed to working with both Governments to resolve bilateral issues, at their request. In his briefing, in addition to a range of other issues related to Iraq, the envoy also addressed the situation affecting Iranian exiles located in a camp outside of the capital, Baghdad, urging the international community to come forward with offers for their resettlement. “I wish to emphasize that Camp Liberty was only meant to be an interim facility to facilitate the Refugee Status Determination and subsequent resettlement in third countries,” the Secretary-General’s Special Representative and head of the UN Assistance Mission for Iraq (UNAMI), Martin Kobler, told a Security Council meeting on the situation in the Middle Eastern country. “I should like to take this opportunity to reiterate the Secretary-General’s appeal to Member States to offer resettlement opportunities to former residents of Camp Ashraf – without such an undertaking, there can be no sustainable solution for the residents,” he added. In line with a memorandum of understanding signed in December by the UN and the Iraqi Government to resolve the situation, more than 3,100 of the 3,280 residents originally in Camp Ashraf – now also known as Camp New Iraq – have been re-located to a temporary transit location near Baghdad, known as Camp Hurriya – and formerly known as Camp Liberty – where a process to determine refugee status is being carried out by the Office of the UN High Commissioner for Refugees (UNHCR). There are 100 residents left in Camp Ashraf. The issue of Camp Ashraf – located in eastern Iraq and once made up of several thousand Iranian exiles, many of them members of a group known as the People’s Mojahedeen of Iran – has been one of the main issues dealt with by UNAMI for more than a year. He noted that UNAMI has spared no effort over the last weeks to help facilitate meetings between involved parties – however, these efforts have been unsuccessful so far, leading to a stalemate. The envoy also called on the Government of Iraq to maintain the peaceful relocation of the residents as stipulated in the memorandum of understanding, to demonstrate restraint, and be as flexible as possible when it comes to resolving property-related issues. “I urge the residents to engage constructively with the Government of Iraq and the United Nations so that Camp Ashraf can be closed peacefully and efforts can focus on the residents’ resettlement to third countries,” he added. Reuters - U.N. chief Ban Ki-moon appealed on Thursday for countries to consider resettling several thousand Iranian dissidents living in Iraq who were recently moved to a former U.S. military base in Baghdad from a camp where they lived for decades. In a report to the Security Council, Ban said 3,112 members of the People's Mujahideen Organization of Iran have been transferred to Camp Hurriya, leaving about 100 still at Camp Ashraf - also know as Camp New Iraq - to help close it down. Ashraf residents agreed in February to move to the new camp, where the United Nations intends to process them for refugee status in other countries, but they have complained that the conditions at the new base are poor and that they have not been permitted to bring many of their personal belongings. The group is no longer welcome in Iraq under the Shi'ite Muslim-led government that came to power after U.S.-led forces invaded and toppled Saddam in 2003. Clashes between Ashraf residents and Iraqi security forces last year killed 34 people. Ban said so far only 31 people had been accepted by other countries and that it was now a matter of urgency that they be offered resettlement opportunities in other countries. "Without the strong commitment of member states to accept former residents of Camp New Iraq, no sustainable solution can be achieved," Ban said in the report. "I appeal to member states to offer resettlement opportunities to residents with international protection needs as soon as possible." In September the U.S. State Department removed the dissident group from its official list of terrorist organizations but underscored serious concerns about the group which is seeking to recast itself as an Iranian opposition force. The group calls for the overthrow of Iran's clerical leaders and fought alongside Saddam's forces in the Iran-Iraq war in the 1980s. It also led a guerrilla campaign against the U.S.-backed Shah of Iran in the 1970s, including attacks on U.S. targets. The group surrendered weapons to U.S. forces after the 2003 invasion of Iraq and the fate of Ashraf's residents has been in question since Iraqi authorities took over the camp from U.S. forces in 2009 under a bilateral security pact. Iraq’s Prime Minister Nuri al-Maliki has urged the expedition of MKO members’ expulsion from the Iraqi soil within the framework of the agreement signed with the United Nations. According to the statement, Maliki urged the United Nations to speed up the closure of MKO’s case in Iraq. 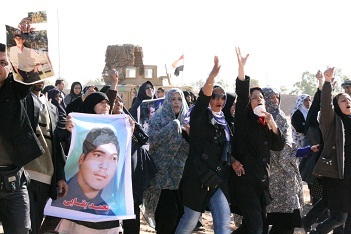 The relocation of roughly 3400 members of terrorist MKO group from Camp Ashraf to Camp Liberty is in line with the memorandum of understanding signed on 25 December between Iraq and United Nations to temporarily transfer them to a former US military base in Baghdad for the UNHCR to determine their refugee status. Iraq’s forthcoming elections and excluding the country from chapter VII of the UN charter were among other issues discussed at the meeting. According to a security official in charge of the protection of Camp Liberty near Baghdad, a veteran member of the Mojahedin Khalq terrorist organisation (known as the Rajavi cult) set fire to himself at dawn this morning. The official reported that a man named Shahram Mohseni set fire to himself in protest at dawn today (Sunday), adding that although Mohseni suffered serious burns to his legs and back it had been possible to save his life. Officials at Camp Liberty report that many MEK members are suffering from mental illness because of the pressures they have been under for the past three decades. During a visit to Camp Ashraf which was the former base of the MEK, Iraq's National Security Advisor, Faleh al-Fayad, said that all members of this organisation will be deported and found alternative locations over the next few weeks in coordination with the UN mission in Baghdad. He emphasised that irrelevant to what the Americans have announced by removing them from their terrorism list, the Government of Iraq continues to regard the MEK as a terrorist and criminal organisation. Fayad said that the MEK were condemned by the Iraqi people because of their participation in the suppression of the uprising in 1991 in the suppression of the Kurdish uprising in the north of Iraq under the command of Saddam Hussein's regime. The United Nations’ special representative for Iraq says 3,000 residents of the camp that's served as a base for an Iranian exile group have moved to a transit site. Kobler said all the residents will have interviews at Camp Liberty, near Baghdad, before getting the status of internationally protected persons from the UN High Commissioner for Refugees. Camp Ashraf has been the base of the Mujahedin-e Khalq Organization (MKO), an Iranian opposition group that has been designated as a terrorist organization by Tehran. The United States removed the MKO from its list of foreign terrorist organizations in September. كوبلر: نقل 3000 من عناصر "مجاهدين خلق"
أعلن ممثل الأمم المتحدة في العراق مارتن كوبلر الإنتهاء من نقل أكثر من ثلاثة آلاف من عناصر منظمة "مجاهدين خلق" الإيرانية المعارضة من "معسكر أشرف" بديالى إلى "مخيم الحرية" ببغداد. وأشار كوبلر في حديث لإذاعة العراق الحر إلى إلى ان الحكومة العراقية تريد أن ينقل جميع سكان اشرف إلى معسكر الحرية، غير أنه أكد ضرورة أن يتم ذلك على أساس طوعي، وأوضح أن من تبقى في معسكر اشرف لا يتجاوز عددهم 100 شخص، وسيتم نقلهم أيضا ما أن تنتهي إجراءات التسليم الفنية. وذكر المسؤول الدولي ان المفوضية العليا لشؤون اللاجئين تسعى في الوقت الحاضر لإعادة توطين عناصر المنظمة في بلدان أخرى، مؤكداً وجود خطة واضحة بهذا الخصوص، واشار الى إن مقابلات سيتم إجراؤها مع جميع سكان معسكر الحرية الذين سيحصلون على صفة أشخاص يتمتعون بالحماية الدولية من المفوضية العليا لشؤون اللاجئين، وقال انه وفقاً لهذه الصفة سيتم توطينهم في مناطق أخرى خارج العراق. تأسست منظمة "مجاهدين خلق" في عام 1965 ثم طردت من إيران خلال الثمانينات ليستقبلها العراق في عام 1986، ورافق وجودها في الأراضي العراقية الكثير من الأحداث والتصريحات الايجابية والسلبية، ويقول الخبير القانوني طارق العادلي رداً على سؤال لإذاعة العراق الحر عن وضع هذه الجماعة القانوني، إنهم عندما دخلوا البلاد في عهد النظام السابق لم يتم منحهم إقامة رسمية مما يجعلهم بلا وجود شرعي في العراق ولا حتى كلاجئين. العادلي نبه إلى أن هذا الأمر لا ينطبق على جماعات أخرى مثل الفلسطينيين والسوريين الذين كانوا في العراق وما زالوا فيه وذلك لان هؤلاء حصلوا على أوراق رسمية من الدولة تثبت حقهم في الإقامة في العراق. ​​تخليها عن مبدأ العنف. هذا ومع التغيير في العراق رأت الحكومة العراقية أن وجود المنظمة غير مرغوب فيه وراحت تسعى إلى إخراج عناصرها من الأراضي العراقية. وكان من المفترض إغلاق معسكر اشرف في نهاية العام الماضي 2011 غير أن الحكومة العراقية والأمم المتحدة وقعتا اتفاقا لتمديد بقاء عناصر المنظمة لمدة ستة أشهر أخرى وقد انتهت هذه الأشهر الستة وما يزال عناصر مجاهدي خلق في العراق. ويقول أستاذ العلاقات الدولية في جامعة بغداد حميد فاضل إن من مصلحة العراق الانتهاء من ملف "مجاهدين خلق" غير انه نبه إلى أن ملفهم متشابك على الصعيد الدولي وهو ما يؤخر تقبلهم في دول أخرى وذلك لان اسمهم ارتبط في فترة ما بالإرهاب وهو ما يعرقل الكثير من الجهود لتوطينهم في أماكن أخرى. وكانت منظمة "مجاهدين خلق" ، سعت جاهدة منذ إعلان تخليها عن العنف لتغيير صورتها وسمعتها في العالم ونظمت حملة إعلامية واسعة لرفع اسمها من لائحة الإرهاب علما أن اسمها دخل لائحة الإرهاب في الولايات المتحدة منذ عام 1997. وفي 28 أيلول الماضي قررت واشنطن رفع اسم منظمة مجاهدي خلق من لائحة الإرهاب وكان الاتحاد الأوربي قد رفع اسمها من لائحته الخاصة بالإرهاب في عام 2009. وفي هذه السنة أيضا تسلمت السلطات العراقية مسؤولية المعسكر من القوات الأميركية. ويرى عميد كلية العلوم السياسية في جامعة النهرين عامر حسن فياض أن الدول التي رفعت صفة الإرهاب عن منظمة "مجاهدين خلق" هي التي عليها أن تمنح عناصرها توطيناً لديها لان وجود المنظمة حتى الآن في الأراضي العراقية يسبب إحراجا للعراق أمام إيران، حسب قوله. خلال الأشهر السابقة تم نقل عناصر مجاهدي خلق إلى معسكر الحرية ووصلت آخر دفعة في السادس عشر من أيلول الماضي ليصبح عدد الذين نقلوا أكثر من ثلاثة آلاف شخص. من جهته قال المحلل السياسي خالد السراي إن العراق لا يستطيع تحمل بقاء عناصر مجاهدي خلق على أراضيه وسيكون على الأمم المتحدة أن تجد الحل بنفسها. ساهم في إعداد هذا التقرير مراسل إذاعة العراق الحر في بغداد محمد كريم. Sahar Family Foundation has written an open letter to Mr Ban Ki Moon, the UN Secretary General, and has sent the copies to the international media and the appropriate authorities. Arrange for the meeting of the families with their loved ones in order to end their sufferings. The news received from Camp Liberty indicates that the cultic relationships and standards are still imposed at their most intense. The members are told that they are bound to stay in Iraq and no one is allowed to leave. The members are also frightened about what the consequences would be if they leave the organization or seek to visit their families. The phobia of ‘extradition to Iran and facing torture and execution’ is systematically cultivated in the minds of the members. The MKO authorities have clearly told the members that the National Liberation Army (Saddam Hussein’s private army of Rajavi) is the MKO’s sole capital investment and will never, under any circumstances, be given up. The leaders have emphasized that arms and weapons are not detachable from the MKO’s struggle. As the obstacle of the FTO list has been removed and access by UN officials to the MKO members is much easier in Camp Liberty, there is no excuse for not arranging family meetings for the members. The families are eager to independently make sure about the physical and mental wellbeing of their loved ones. The MKO is claiming that the members have chosen their destiny willingly and knowingly and that they have no desire to visit their families. There are many documents however which prove these individuals are systemically mind manipulated and their willpower has been psychologically robbed from them. UN officials have the capacity to arrange these meetings without the interference of the MKO authorities. The same thing has been arranged in other parts of the world in the past. This excuse that the MKO leaders do not cooperate can no longer be acceptable and it is the duty of the UN officials to demand that the MKO leaders give the members their most basic human rights. If the leaders are refusing to do so, it is surely right for the UN to announce it publicly and not just in private meetings. We wish to thank you in advance on behalf of the families. The consequences of de-proscribing the Mojahedin-e Khalq Organization (MKO) by the US State Department, which Rajavi was so eager about and in recent years had become the top priority of his cult, have been discussed and analyzed in various ways by various entities. Since our task is not political and we are by no means experts, we leave the analysis to the professionals. But as far as the suffering families of the members of the MKO are concerned, who have no request except to visit their loved ones and be sure about their physical and mental wellbeing, this development gives them fresh hope. Perhaps now the MKO will accept its obligations which will lead it to meeting the just demands of the families. Although it is claimed that the MKO has not officially performed any terrorist act for political purposes for more than a decade, the US State Department’s report states its strong concerns about MKO maltreatment against the members and their families and violation of human rights inside the organization. Rajavi is still insisting on keeping the members in isolation from the outside world, in particular from their families. The cultic relationship and internal mind manipulation and the so called “current operation” daily sessions for brainwashing of the followers are practiced more severely than ever. The same apartheid policy to limit contact of the members between themselves, as well as the outside world, has been imposed in Camp Liberty after moving from Camp Ashraf. News emerging from the temporary transit camp Liberty indicates that the physical separation inside the camp between units, which is essential for keeping control over the members, is practiced in different ways. The cult, away from the eyes of the UN and Iraqi officials, has begun to dig wells and has used the excavated soil to create embankments between the units to separate them from each other and prevent the residents from having access to one another. The cult has also used artificial trees to form boundaries between units. Although the MKO has publicly accepted that they will soon leave Camp Liberty and Iraq, inside the cult the members are constantly told by even Massoud Rajavi himself that Liberty is another Ashraf and they will not leave Iraq under any circumstances. Up to now 12 individuals have managed to escape from Camp Liberty and by doing so they have left the organization. All of them have emphasized that severe physical and psychological pressure and control is imposed over the members and all routes of escape, both physical and mental, have been blocked. This news also reveals that the cult has briefed the members about Nejat Society in Iran, Iran Interlink in Europe, and the Sahar Family Foundation in Iraq and has told them that these bodies are the agents of Iran’s ministry of intelligence and their task is to capture the defectors and hand them over to the Iranian authorities to be taken back to Iran and face torture and execution. By doing so they try to create phobia inside the minds of the members and prevent them from accepting the assistance offered to them to contact their families and to start a new life after leaving the organization. Nevertheless, the families are generally more hopeful than ever and they see a bright future when they can embrace their loved ones after so many years of separation and no news. Sahar Family Foundation once again draws the attention of all Iraqi and international bodies and officials to the severe violation of human rights inside Camp Liberty and all the control measures practiced there. We urge the international community to be concerned about the situation and use every possible means to stop the MKO from violating the members’ most basic human rights. “Our message hope, Our promise, freedom”. They entered Iraq to visit their loved ones, imprisoned in the Cult of Rajavi. All those MKO members who recently defected the Cult notified that families’ presence at Camp Ashraf and hearing their voice via loudspeakers have been a very motivating and hope-giving to members. The families suffer the hardships of traveling to Iraq in order to give the hope of salvation to their loved ones held as hostages in hands of the cult-monsters. Such a determination will definitely win and thank to the God, the promised day of the salvation of hostages of Rajavi’s Cult is not far away. 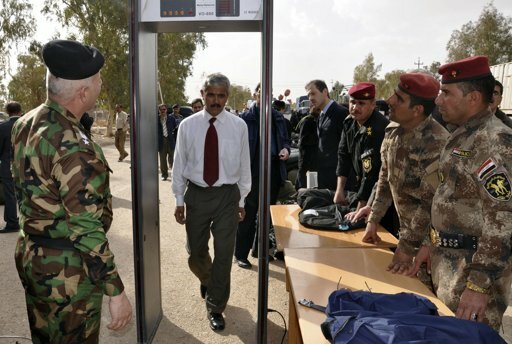 What’s new at Camp Liberty in Baghdad? Liberty base is a huge military facility near Baghdad International Airport, which was originally created as part of a bigger base called Victory, to house American troops in Iraq. Formerly named Victory North, after September 2004 it was renamed Liberty. Over the current year some 2000 inhabitants of Camp Ashraf of the Mojahedin-e Khalq Organization (MKO, Rajavi cult), were moved to this base as a United Nations Temporary Transit Camp from where they are to be eventually transferred out of Iraq. In May the MKO stopped cooperating with the relocation process and at the present time around 1200 members of the MKO have remained stuck in Camp Ashraf. Information received from inside both Ashraf and Liberty relates that all other tasks can be stopped inside the MKO so that the process of mind manipulation and brainwashing sessions are not stopped. These reports state that each member attends 3 to 5 meetings of this kind each day. In these meetings - under the label of opportunism - the issue of escaping from the cult is discussed and everyone is continuously told that leaving the cult is the most severe sin that a follower can commit. The MKO argues that leaving the cult undermines the resistance against Iran and damages their struggle. By doing this they intend to create mental barriers for the members to keep them captive inside the organization. These reports from inside the MKO indicate that there is an ideological argument within the Organization which forbids the members to compare themselves with others. Since the relocation process began in February several members who have been transferred to Camp Liberty have had routine interviews with UN officials in Iraq. These people were put forward by the MKO and the process is still ongoing. Others were puzzled as to why some people have been sent for the interviews and they haven’t. They have been asked to report to their superiors if they have such sinful thoughts. The same argument has been introduced in Camp Ashraf. Some are wondering why they have not been sent to Camp Liberty and are made to remain in Ashraf. They also have to report that they are comparing themselves and their situation to that of others. Another argument amongst the residents of the Liberty is about the possibility of their being sent abroad. Since the camp is located near to the airport, most inhabitants watch the airplanes taking off with sorrow and regret. The cult leaders have asked the members to report such sinful desires to their superiors as a cultic practice. These kinds of thoughts are severely denounced and are considered as ideological weakness. One method of manipulation used by destructive mind control cults is to keep their followers busy with useless tasks all the time in order to prevent them from thinking freely. This method is used systematically inside the Rajavi cult to render the members so exhausted that their minds cannot function properly. When members were transferred from Ashraf to Liberty they were only permitted to take personal possessions. But the MKO managed to also take some stretchers as medical equipment. These stretchers are now used to shift sand. They have the members move sand which is stored in one place and which is meant to be used to pave the passageways between the bungalows. The members are forced to relocate this sand from one place to another using the stretchers, and they keep doing this using various excuses. They are also asked to separate out large pebbles from the sand with the excuse that when they pave the pathways these would hurt the elderly residents. The exhaustion caused by this kind of hard work prevents the members from thinking about their uncertain future and the deadlock they are in. The reports from Camp Liberty also indicate that there is constant conflict between the members and their superiors. Such conflicts are due to the tense situation inside the camp caused by the uncertainty of almost everything and manifest in swearing and name calling. The extent of this conflict is at a stage that one can predict they will soon turn into physical conflict. Further information reveals that some members who insist on leaving the cult are being coerced to stay as guests. Since they have been made afraid of the outside world and they believe they have nowhere to go, they have accepted this. This has been Rajavi’s latest technique to keep his followers inside the cult and prevent them from leaving. These people are also asked to participate in the meetings but they refuse and say that they are only guests. Mr. Ali Hussein-Nezhad, the former veteran member of the MKO who has recently managed to escape form Camp Liberty and gain his freedom, has written a letter to Mr. Martin Kobler. Around three months ago, immediately after walking out of Camp Liberty, I met you and Mr. Nicola, head of the UNAMI human rights delegation in Baghdad. Two months ago I wrote my first letter to you. In our meeting I described the suppression and repression and the cultic behavior and relationships inside Ashraf and Liberty, and how the members are kept unaware about the outside world and about their families. I defined how the followers of the Rajavi cult are forced to divorce their spouses and abandon their children and suppress all feelings but those towards the leadership. I emphasized that all means of contact and communication with the outside world including internet, mobile phone, telephone, radio, television, newspaper, and etc. are forbidden. Even reading books is considered out of the question by the leaders of the MKO. Both in our meeting and in my first letter I declared that the cult has killed all normal human feelings inside the mind and soul of the members. Any kind of contact with the outside world, particularly with family and friends is forbidden. One must not even think about family relations inside the cult and any such thoughts must be reported as 'mal thinking'. I informed you that even inside Camp Ashraf they prevented me from visiting my daughter who is also a member of the organization and residing in the same camp. In previous years we were able to meet once a year on the Persian New Year for about one or two hours, a meeting which was under the total supervision of the superiors. But this year they announced there would be no family visits inside the camp. It is almost one and a half years that I have not seen my daughter Zeinab. When I was being transferred to Camp Liberty in the fourth group, I was told that my daughter would be sent soon after me. But I learned from the Iraqi officials that she is still in Camp Ashraf. In fact they have kept my daughter as a hostage to make me keep quiet. They also do not wish my daughter to learn that I have left the organization. My daughter is registered on the list of UNHCR asylum seekers, the number is 350 and my registration number is 920. We were both granted French travel documents in 1988 following our arrival in France in 1986. My daughter called her younger sister in Iran at the request of the organization around 6 years ago and never called again. I am worried about her since no one, even in a prison, would reject family contacts. These people are deprived of any sort of outside communication. I am sure that there is a lot of pressure on my daughter and that they will not let her go to Camp Liberty and I should say that her life is really in danger. Therefore I urge you to put pressure on the officials of the MKO in Camp Ashraf and persuade them to allow me and my younger daughter to meet with my 34 year old daughter Zeinab. The leader of the MKO has turned the organization into a destructive mind control cult and has no aim but saving himself by sacrificing the innocent people who are his captives in Ashraf and in Liberty. He intends to provoke clashes with the Iraqi government and forces and this is the reason behind creating obstacles in the process of transition and creating unreasonable conditions. He aims to buy time and is waiting for some delusional political conditions in his favor which will enable him to stay in Iraq. This is why he does not wish to leave Ashraf and give it away. He knows full well that by leaving Ashraf the pressure on his cult will be enormous and this could result in his cult being dissolved. Rajavi has even rejected Iraq’s humane proposal of moving the residents of Ashraf into hotels, a proposal which you backed. This exposed the real aim of the leaders of the cult; that all they are intending is to keep the cultic relationship and save the cult intact. The MKO in its statement called Iraq’s proposal gruesome and a plot against the organization and your dirty souvenir from Tehran. The MKO leaders have insulted you on many occasions in its propaganda since you did not accept all their unjust demands. Everyone knows about your humanitarian efforts to solve the problem and praise your exertions but Rajavi is not happy with the problem being solved peacefully and has asked for a UN representative appointed for Ashraf. They are playing the same game they played against Mr. Butler, the former representative of the USA in the negotiations with the MKO to move the residents of Ashraf elsewhere. When Mr. Butler finally announced that the leaders of the MKO do not intend to solve the problem peacefully they denounced him, but finally they had to accept leaving Ashraf. All conditions announced by the MKO would be achieved by transferring the residents to hotels except conditions such as creating a green environment and manual work which are intended only to create conditions to remain in Iraq and not be transferred to a third country. They became so angered by this proposal from the Iraqi government that they wanted to leave the meeting. This clearly shows that moving into a hotel means that the hostages and the victims would have a chance to free themselves from this inhuman cult. This rejection shows how the leaders of the cult are afraid of their Stalinist organization being dismantled. The reason is that in a hotel they would not be able to force the members to perform hard labor and they would not be able to keep the members inside the boundaries of control and systematically brainwash them. In this case they would not be able to use the members as human shields to protect the leaders. The two conditions that the MKO have put forward are having permission to sell their belongings and freedom of movement. Firstly I should say that the leader of the MKO has no rights over these so-called belongings since they are the property of the people and the government of Iraq. When I was the senior interpreter for Rajavi in the Foreign Relations Department since the year 2000 (the part which deals with the affairs with Iraq both before and after the fall of Saddam Hussein), I witnessed that at least 3 million barrels of oil a day was received from the Iraqi ministry of oil (equivalent to 90 million dollars according to the price of oil in those days), in line with the UN policy of oil for food and medicine. They used to sell this oil on the international market and have money for their necessities. In this way they were able to buy cars and other goods. Secondly I must emphasize that they want freedom of movement only for their top officials. The ordinary members have always been deprived of free movement, even inside the camps, since they are afraid they might escape. In the past both in Ashraf and in Liberty the leaders of the cult have prevented the members from moving freely even within the camps, let alone letting them leave the camps. All sorts of posts and checkpoints have been established to limit the movement of ordinary members. They did not even allow those sick and injured people about whom they had doubts about their loyalty to go outside the camp for further medical treatment. Only recently they allowed some of those with severe illness out of the camp, but only after it were too late and they only dismissed them in order to let them die outside the camp and evade the consequences. It is hypocrisy for the leaders to complain about the conditions of Camp Liberty and compare it with a prison when they have kept the members captive for more than 30 years. The one who has turned Ashraf, and now Liberty, into a prison is Massoud Rajavi. A unique prison with no rights of access to their families, no letters, no telephone, no email, and of course no meetings. In any prison in any place in the world, even in the harshest dictatorships, prisoners have the right to contact their families and even have the right to go on leave to visit them. Recently the UN has issued a statement and declared that the residents of Camp Liberty have no access to the outside world and called for freedom of contact with their families. To clarify this matter further and in order to reveal Rajavi’s aim behind such demands, I propose that the government of Iraq declares its readiness to allow MKO members to go for pilgrimage to the holy cities of Kerbela and Najaf in groups. In this case the leaders of the MKO would certainly reject the offer and as in previous cases would call it a conspiracy to destroy the “Iranian Resistance!” which means their only concern is the freedom of the captive residents and that they might escape. It would be a nightmare for Rajavi if the families would also go with them on this pilgrimage. According to the atmosphere I was witnessed inside the organization, the vast majority of the members, particularly the veterans, would leave the cult provided they find a suitable moment. I can give you the names and details of many of my colleagues inside both Ashraf and Liberty who are under severe pressure and they really wish to leave and I have informed Mr. Nicola the head of the UN human rights monitoring group about them. The leaders of the MKO prevent the members from even thinking about going to a third country and force them to give reports if they have such so-called evil thoughts and to be ready to be denounced and humiliated and be accused of betraying the struggle. Maryam Rajavi declared in her last statement in March before the move to Liberty that we must turn Liberty the most beautiful city in the world and make it just like Ashraf. Abbas Davari in a meeting inside the Americans' church in Liberty said that 'they say this is a transit and interim camp, I say the whole world is temporary and it is seventy years that I am in transit. We will stay here to the end of our lives'. Massoumeh Malek-Mohammadi also said in another meeting that this is not a transit camp, but another Ashraf for us. Massoud Rajavi in a call-conference for our group (the forth one) before leaving Ashraf said that 'we wish to have two Ashraf garrisons and you will see how the Iranian regime will condemn Maleki because he was meant to get rid of us and now we have two bases'. This was followed by the crowd cheering. If you see the MKO propaganda in Europe and in America and follow their lobbying activities you will notice that their aim is to remain in Iraq and they have no intention of leaving Iraq for another country. You rightly asked everyone to be active toward the MKO to force the leaders to cooperate with the UN to move the residents of Liberty to another country. As far as I have been in touch with the ex-members, all are eager for a peaceful solution for the MKO in order to be moved to a safer place. They must have the right to be informed about the outside world and choose their own destiny. The excuses Rajavi invents to keep them inside Iraq for his evil purposes should be condemned. I fully back your efforts for a peaceful solution to the dilemma of the MKO in Iraq and I urge you not to be influenced by the MKO lobby which is active in the western countries and be firm in demanding the MKO leaders to allow the captives to be free. The best thing to do is to permit the families to stay nearby Camp Liberty and provide facilities for them to meet their beloved ones and negate the negative atmosphere created against the families by the MKO and stop the brainwashing of members and creating phobia inside their minds against the outside world and ensure they have full and free access to telephone and internet and radio and television and publications. I sincerely thank you and wish you every success in your good work. A defected member of the anti-Iran terrorist Mojahedin-e Khalq Organization (MKO also known as the MEK, PMOI and NCR) disclosed that the terrorist group is seeking to spark a bloody conflict with the Iraqi government's security forces before leaving its main stronghold in Iraq, known as Camp Ashraf. "The MKO's (main) ringleader, Massoud Rajavi, intends to ignore the Iraqi government's warnings and the UN advice in a bid to pave the ground for the Iraqi government's military reaction and use of force to misuse the resulting events," the defected member said, quoted by the Habilian Association - a human rights group formed of the families of 17,000 Iranian terror victims. Rajavi had earlier in his remarks said neglecting the Iraqi government's ultimatum for leaving Camp Ashraf is an honor for him and his terrorist group. The defected member said that Rajavi shows such defiance while he severely needs the blood of the Camp Ashraf residents to stabilize his conditions in Europe and attain his goals. Since the 2003 US invasion of Iraq, the group, which now adheres to a pro-free-market philosophy, has been strongly backed by neo-conservatives in the United States, who also argue for the MKO to be taken off the US terror list. The United Nations top envoy in Iraq today hailed the relocation of another group of 400 Iranian exiles from a camp outside of the capital, Baghdad, to a new location, prior to their eventual resettlement in third countries. “I welcome the residents’ decision to re-commence the relocation process from Camp Ashraf to Camp Hurriya,” the Secretary-General's Special Representative for Iraq, Martin Kobler, said in a news release issued by the UN Assistance Mission for Iraq (UNAMI), which he also heads. The issue of Camp Ashraf – located in eastern Iraq and made up of several thousand Iranian exiles, many of them members of a group known as the People’s Mojahedeen of Iran – has been one of the main issues dealt with by UNAMI for more than 18 months. The news release further noted that Mr. Kobler requested that the Government of Iraq “be generous” to the camp residents in regards to their humanitarian needs, while also reiterating his appeal to Member States to accept the refugees upon resettlement in their countries. Prior to today’s transfer, close to 1,300 individuals were still awaiting relocation from Camp Ashraf to the transit centre. UNAMI staff have been monitoring the human rights and humanitarian situation during the relocation process and provide round-the-clock human rights monitoring at Camp Hurriya. The United States welcomes today’s safe arrival of the sixth convoy of approximately 400 Ashraf residents to Camp Hurriya, the first such convoy in over three months. We welcome and are encouraged by this resumption of cooperation by the Ashraf residents in the relocation process as set forth in the December 25, 2011 Memorandum of Understanding (MOU) between the Government of Iraq and the United Nations. We call on the Camp Ashraf leadership to continue this progress by cooperating with the expeditious relocation of the approximately 800 remaining residents at Camp Ashraf. The Government of Iraq has made considerable efforts to achieve a peaceful and secure resolution for the residents of Camp Ashraf, and we urge continued steps to address humanitarian concerns raised at Camp Hurriya by the residents. Recent progress includes the commencement of construction on a water purification station linked to an outside water source. The United States encourages these efforts and reiterates its commitment to work towards resolution of humanitarian issues at Hurriya, including sustainable means for the continued supply of water and electricity. The United States also reiterates its commitment to support the safety and security of the residents throughout the process of their relocation outside of Iraq. Mojahedin Khalq (MKO, MEK, Rajavi cult) remains on the list Foreign Terrorist Organizations in U.S.
3. The organization's terrorist activity or terrorism must threaten the security of U.S. nationals or the national security (national defense, foreign relations, or the economic interests) of the United States. Description: Designated as a Foreign Terrorist Organization on October 8, 1997, the Mujahadin-E Khalq Organization ( MEK) is a Marxist-Islamic Organization that seeks the overthrow of the Iranian regime through its military wing, the National Liberation Army (NLA), and its political front, the National Council of Resistance of Iran (NCRI). The MEK was founded in 1963 by a group of college-educated Iranian Marxists who opposed the country's pro-western ruler, Shah Mohammad Reza Pahlavi. The group participated in the 1979 Islamic Revolution that replaced the Shah with a Shiite Islamist regime led by Ayatollah Khomeini. However, the MEK's ideology – a blend of Marxism, feminism, and Islamism – was at odds with the post-revolutionary government, and its original leadership was soon executed by the Khomeini regime. In 1981, the group was driven from its bases on the Iran-Iraq border and resettled in Paris, where it began supporting Iraq in its eight-year war against Khomeini's Iran. In 1986, after France recognized the Iranian regime, the MEK moved its headquarters to Iraq, which facilitated its terrorist activities in Iran. From 2003 through the end of 2011, roughly 3,400 MEK members were encamped at Ashraf in Iraq. Activities: The group's worldwide campaign against the Iranian government uses propaganda and terrorism to achieve its objectives. During the 1970s, the MEK staged terrorist attacks inside Iran and killed several U.S. military personnel and civilians working on defense projects in Tehran. In 1972, the MEK set off bombs in Tehran at the U.S. Information Service office (part of the U.S. Embassy), the Iran-American Society, and the offices of several U.S. companies to protest the visit of President Nixon to Iran. In 1973, the MEK assassinated the deputy chief of the U.S. Military Mission in Tehran and bombed several businesses, including Shell Oil. In 1974, the MEK set off bombs in Tehran at the offices of U.S. companies to protest the visit of then U.S. Secretary of State Kissinger. In 1975, the MEK assassinated two U.S. military officers who were members of the U.S. Military Assistance Advisory Group in Tehran. In 1976, the MEK assassinated two U.S. citizens who were employees of Rockwell International in Tehran. In 1979, the group claimed responsibility for the murder of an American Texaco executive. Alhough denied by the MEK, analysis based on eyewitness accounts and MEK documents demonstrates that MEK members participated in and supported the 1979 takeover of the U.S. Embassy in Tehran and that the MEK later argued against the early release of the American hostages. The MEK also provided personnel to guard and defend the site of the U.S. Embassy in Tehran, following the takeover of the Embassy. In 1981, MEK leadership attempted to overthrow the newly installed Islamic regime; Iranian security forces subsequently initiated a crackdown on the group. The MEK instigated a bombing campaign, including an attack against the head office of the Islamic Republic Party and the Prime Minister's office, which killed some 70 high-ranking Iranian officials, including Chief Justice Ayatollah Mohammad Beheshti, President Mohammad-Ali Rajaei, and Prime Minister Mohammad-Javad Bahonar. These attacks resulted in an expanded Iranian government crackdown that forced MEK leaders to flee to France. For five years, the MEK continued to wage its terrorist campaign from its Paris headquarters. Expelled by France in 1986, MEK leaders turned to Saddam Hussein's regime for basing, financial support, and training. Near the end of the 1980-1988 Iran-Iraq War, Baghdad armed the MEK with heavy military equipment and deployed thousands of MEK fighters in suicidal, waves of attacks against Iranian forces. 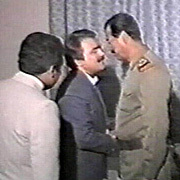 The MEK's relationship with the former Iraqi regime continued through the 1990s. 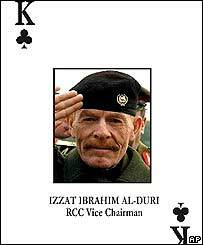 In 1991, the group reportedly assisted the Iraqi Republican Guard's bloody crackdown on Iraqi Shia and Kurds who rose up against Saddam Hussein's regime. In April 1992, the MEK conducted near-simultaneous attacks on Iranian embassies and consular missions in 13 countries, including against the Iranian mission to the United Nations in New York, demonstrating the group's ability to mount large-scale operations overseas. In June 1998, the MEK was implicated in a series of bombing and mortar attacks in Iran that killed at least 15 and injured several others. The MEK also assassinated the former Iranian Minister of Prisons in 1998. In April 1999, the MEK targeted key Iranian military officers and assassinated the deputy chief of the Iranian Armed Forces General Staff, Brigadier General Ali Sayyaad Shirazi. In April 2000, the MEK attempted to assassinate the commander of the Nasr Headquarters, Tehran's interagency board responsible for coordinating policies on Iraq. The pace of anti-Iranian operations increased during “Operation Great Bahman” in February 2000, when the group launched a dozen attacks against Iran. One attack included a mortar attack against a major Iranian leadership complex in Tehran that housed the offices of the Supreme Leader and the President. The attack killed one person and injured six other individuals. In March 2000, the MEK launched mortars into a residential district in Tehran, injuring four people and damaging property. In 2000 and 2001, the MEK was involved in regular mortar attacks and hit-and-run raids against Iranian military and law enforcement personnel, as well as government buildings near the Iran-Iraq border. Following an initial Coalition bombardment of the MEK's facilities in Iraq at the outset of Operation Iraqi Freedom, MEK leadership negotiated a cease-fire with Coalition Forces and surrendered their heavy-arms to Coalition control. From 2003 through the end of 2011, roughly 3,400 MEK members were encamped at Ashraf in Iraq. In 2003, French authorities arrested 160 MEK members at operational bases they believed the MEK was using to coordinate financing and planning for terrorist attacks. Upon the arrest of MEK leader Maryam Rajavi, MEK members took to Paris' streets and engaged in self-immolation. French authorities eventually released Rajavi. Strength: Estimates place MEK's worldwide membership at between 5,000 and 10,000 members, with large pockets in Paris and other major European capitals. In Iraq, roughly 3,400 MEK members were gathered at Camp Ashraf, the MEK's main compound north of Baghdad, at the end of 2011. As a condition of the 2003 cease-fire agreement, the MEK relinquished more than 2,000 tanks, armored personnel carriers, and heavy artillery. Location/Area of Operation: The MEK's global support structure remains in place, with associates and supporters scattered throughout Europe and North America. Operations have targeted Iranian government elements across the globe, including in Europe and Iran. The MEK's political arm, the National Council of Resistance of Iran (NCRI), has a global support network with active lobbying and propaganda efforts in major Western capitals. NCRI also has a well-developed media communications strategy. External Aid: Before Operation Iraqi Freedom began in 2003, the MEK received all of its military assistance and most of its financial support from Saddam Hussein. The fall of Saddam Hussein's regime has led the MEK increasingly to rely on front organizations to solicit contributions from expatriate Iranian communities.